The Abandoned Cart email is a regular email report which is sent to you (the site owner) with a list of recent cart abandonments. It includes details like the products the customer had in their cart. When does an Abandoned Cart email send? The Abandoned Cart email is sent daily to your specified System e-mail address when a new Abandoned Cart session is created. How do I turn on/off the Abandoned Cart email? Navigate to Addons and find the Abandoned Cart Saver addon. Click Install and an email will be sent 1 hour after the customer hasn't made any changes to their cart. How can I configure the Abandoned Cart email? 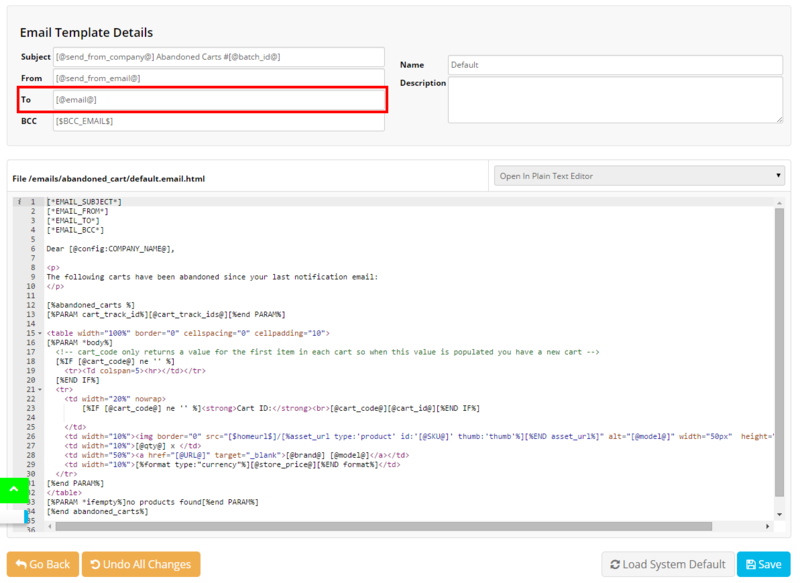 You will need to have the To field populated on your Email Template with either the B@se tag which uses your System e-mail address or by statically defining an email address. If this field is not populated, your template will not work. You can modify this field by navigating to: Settings & Tools > All Settings & Tools. In the System Templates section click Email Templates and then open the Abandoned Cart Email Template. This template is stored here on the file server: /private/www/netosuite/SysDoc/emails/abandoned_cart/default.email.html. What is an Abandoned Cart (customer) email? This is the email that gets sent to a customer after they abandon cart and have entered their email address into that session. When does an Abandoned Cart (customer) email send? The Abandoned Cart (customer) email is sent to the customer if they have abandoned their cart for a set duration of time. This will only occur once per session. How do I turn on/off the Abandoned Cart (customer) email? How can I configure the Abandoned Cart (customer) email? 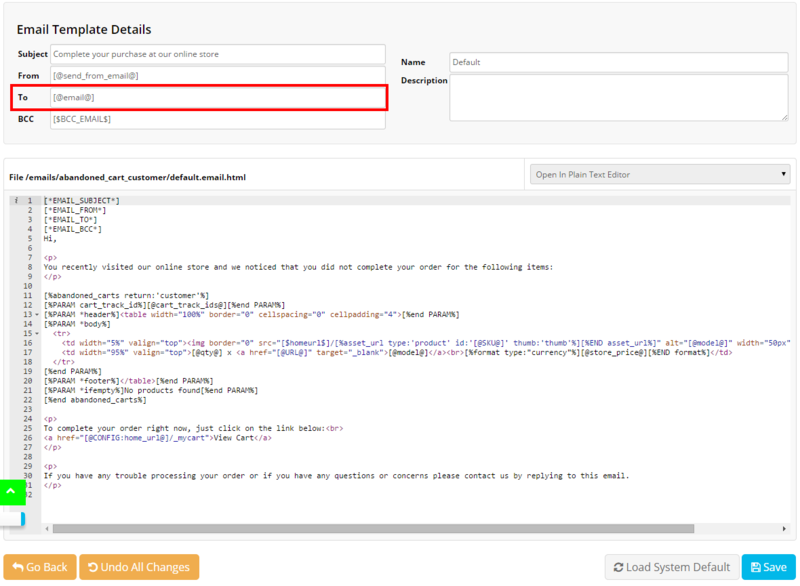 You will need to have the To field populated on your Email Template with either the B@se tag which uses the Customer e-mail address or by statically defining an email address. Settings & Tools > All Settings & Tools. In the System Templates section click Email Templates and then open the Abandoned Cart Customer Email. This template is stored here on the file server: /private/www/netosuite/SysDoc/emails/abandoned_cart_customer/.